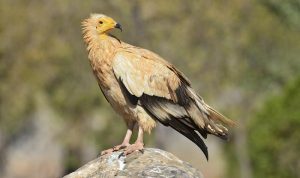 Egyptian vultures are old world raptors with a wide distribution from Western Europe to the eastern fringes of South Asia. They are alternatively known as the pharaoh’s chicken and white scavenger vulture. It is the only member of its genus. 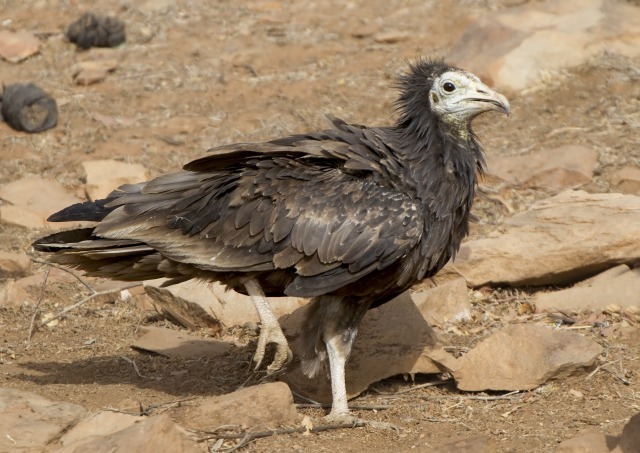 Size: They are small vultures, usually measuring around 1.9-2.3 ft (58-70 cm). Weight: Egyptian vultures have a mass of around 3.5-4.9 lb (1.6-2.2 kg). Wingspan: Their wingspan is between 5-5.6 ft (155-170 cm). Color: They have white plumage with black flight feathers. The face has bare yellow skin. The beak is yellow at the base and black near the tip. N. p. percnopterus occurs in Northern Africa, Southern Europe, Middle East, Central Asia, and Northwest India. 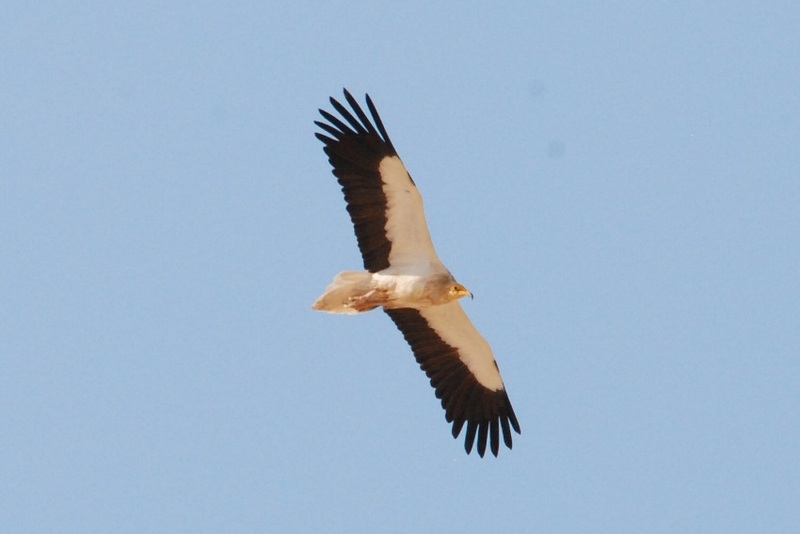 N. p. ginginianus can be found in throughout the Indian Subcontinent. N. p. majorensis live in the eastern Canary Islands. They inhabit deserts, steppes, pastures, and fields. They frequent locations near human settlements, including slaughterhouses, garbage dumps, and fish ports. Their social behavior changes based on the amount of food available to them. 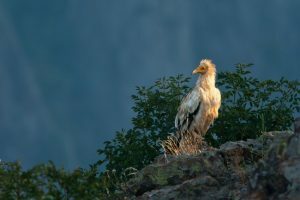 If there is a scarcity they forage alone or along with their partner, but if there is abundance they have been observed to feed along with other Egyptian vultures and even other scavenging birds. 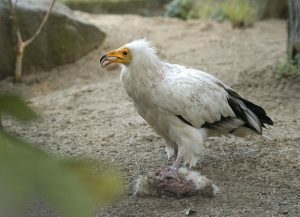 At a feeding site, these birds are second in the pecking order, after the griffon vulture, but before crows and kites. Outside of feeding sites, Egyptian vultures usually live alone or in pairs. They travel around 50 miles (80 km) each day in search of food, flying with other scavenging birds, surveying the ground for a meal. They roost on cliffs, large trees, and buildings in large communal gatherings. Populations in the temperate regions migrate south during the winter, while those found in tropical areas stay put. They feed on carrion, mammal feces, dung insects, small mammals and reptiles, snails, eggs of other birds, nestlings, as well as crustaceans. They are one of the few birds who use tools to their advantage. 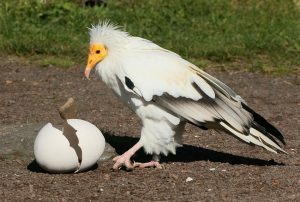 In case of eggs of larger birds like bustards and ostriches, they gather stones and throw it at the egg to crack it open. Egyptian vultures breed in monogamous pairs. The nests they construct are large and refurnished all through the season. Breeding is done once every year. Females lay the eggs between March and May, and then both parents share incubation duties for the next 42 days. Clutches usually consist of two eggs. The second egg usually takes up to five days more than the first one to hatch. The chicks are raised by both parents before eventually fledging after around 71-85 days old and disperse from their parents at 4 months of age. They become sexually mature when they are about 6 years old. 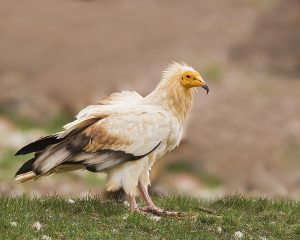 They live for at least 21 years in the wild, but in captivity, the oldest recorded Egyptian vulture was 37 years old when it died. They make screeches while fighting over food, high-pitched mews and hisses during their time in the nest. Juveniles may make a hiss-like croak during flight. 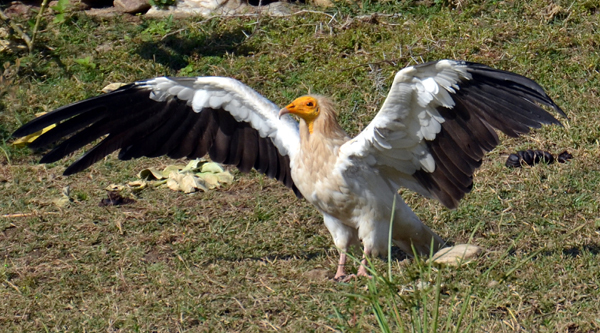 An angry or alarmed Egyptian vulture usually makes a growling sound. The featherless face ensures that the food they eat does not stick on their plumage. The beak is thin enough to ensure that it reaches parts of a carcass that birds with larger beaks cannot. There are no natural predators of this bird in the wild. Red foxes, golden eagles, and eagle owls sometimes prey upon juveniles living in the nest. 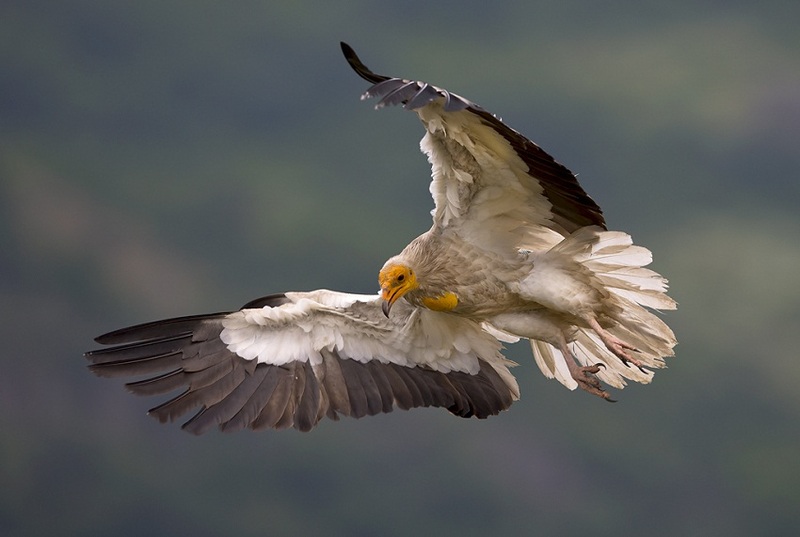 Despite the wide distribution, the IUCN classifies the Egyptian vulture as ‘Endangered’. Habitat loss and persecution by humans have led to the decline in their population. The Egyptian vulture has been highly revered since ancient times in many civilizations, including the Indian, Greek, and Indian. In ancient Egyptian culture, these birds symbolized the goddesses Nekhbet and Mut, being the headdresses (crowns) for both. The bird can also be seen in hieroglyphs. They are the smallest among the old world vultures.